It is not that often that often that I get to review a completely new brand of binoculars, but a friend recently contacted me saying that they were in the advanced stages of introducing some new binoculars onto the market and he wanted to know if I would I like to try them out. The body design is pretty standard for a full sized roof prism binocular and the chassis, according to the manufacturers is made from "PPS", which after a little research on the web, I think they are referring to Polyphenylene sulfide, a high performance thermoplastic that can be molded, extruded, or machined to high tolerances. Whilst this is in no ways bad, I feel it is important to point out that higher spec binoculars will use aluminium, magnesium or even carbon in their body construction. For protection, the chassis has been covered in a thick, dark green rubber coating, which has a pattern cut into it on the sides of each barrel to help with grip. Unlike many binoculars these do not have any thumb indents on the underside of the barrels. At about 5mm, the objective lenses have been placed reasonably far back within the ends of the barrels, which helps with glare and offers a little more protection from scratching. The dust cover at the front of the central hinge can be unscrewed, you can then screw in a tripod adapter to mount these onto a tripod if you wish. With their lens caps removed and the eyecups fully retracted, I measured their length to be 14.2cm (5.6in), twisting out the eyecups it is 14.8cm (5.8in) long. The minimum distance (so when folded) between the centers of the eyepiece lenses is 5.5cm (2.2in) and when the inter-pupillary adjustment is set to the maximum, the distance is 7.3cm (2.9in) and I made them out to be 12.5cm wide when fully opened, which is just a little less than their advertised width. According to the manufacturers these 10x42 Tom Lock Series 1 binoculars are waterproof and all the internal air has been replaced with a dry nitrogen gas, which helps against internal fogging-up of the optical surfaces. 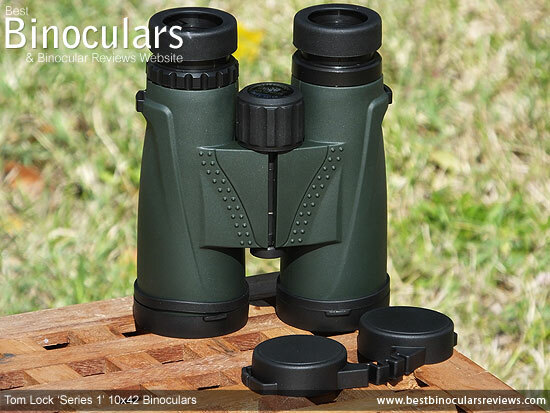 Like most full sized binoculars these days, these Tom Locks have twist up eye-cups which are designed to place your eyes at the right distance away from the ocular lenses so that you see the whole image. The mechanism works really well on these and you get a rather satisfying click as you reach each of the intermediate stops in-between fully extended and fully twisted down. The eye-relief distance on these is 14mm, which is not massive, but this along with one intermediate click stops, should give you just enough flexibility if you wear glasses. The housing looks like it is made from a hard plastic and is then covered in a semi-soft rubber to help with comfort. I measured the external diameter of each eyecup to be 41mm. At 17mm in diameter, the ocular lenses are a perhaps a little smaller that on some full sized bins that I have tested in the past. 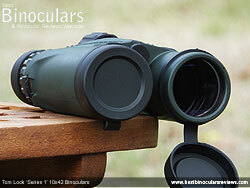 Located in the center of the binocular, the focus wheel turns nice and smoothly. With a soft rubber coating, it is 30mm in diameter and also has ridges cut into it to help with grip and was really easy to adjust even with thick gloves on. To adjust the focus from its minimum near focus to infinity, it takes two full turns of the wheel. Whilst this is a little more than on some and thus extreme adjustments take a little longer, it does have the advantage in that it makes it a little easier to get the focus 100% correct when making fine adjustments. Positioned neat the eyepiece on the right barrel, the diopter adjustment ring is made from plastic and has a number of grooves cut into it to make adjusting it simple enough. Whilst it cannot be locked and does not have any sort of ratchet, I feel that it is tight enough to prevent accidental movement from happening very easily. 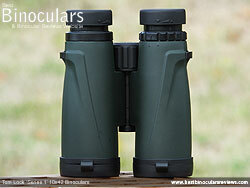 These Tom Lock 10x42 Series 1 binoculars are really simple to attach to a tripod using a standard tripod adapter. To do so, you simply remove the cap at the front of the binocular and screw in the adapter, which can then be mounted on your tripod. 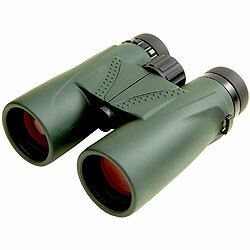 According to the specification sheet that came from the manufacturers, these 10x42 Tom Lock binoculars are multi-coated. As you can see on my guide to anti-reflection lens coatings on binoculars, this means that some, but not all lens surfaces have received multiple coatings of a material that helps to prevent any unwanted light reflection. Whilst it would be preferable for them to be fully multi-coated, this obviously costs more which would add to the total cost of the product. 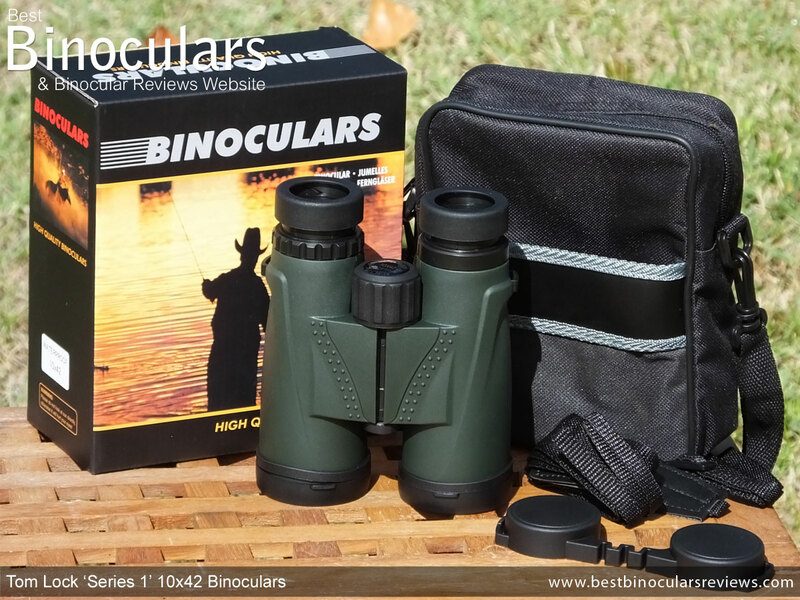 Also keep in mind that many other binoculars in this price range only have a single coating or even worse, don't have any at all. Multi-coatings are far more effective than single coatings and obviously way better than none at all. I was glad to see that the roof prisms on these Tom Lock bins are made from BaK-4 glass, which is far better and outperforms the BK-7 glass prisms found on many other cheap binoculars. However to keep costs down, these don't have any phase correction coatings onto the prism glass. To be fair however neither do most other roof prism binocular in this class and is one of the reasons more expensive, but better quality optics will outperform cheap ones. At 13 feet / 4 meters away their close focus is also on the long side (On BBR anything at 6ft or under is considered excellent). Their maximum eye-relief of 14mm will probably be enough for most people who wear glasses, but I don't consider them to have a long eye relief. Whilst the image through the Tom Lock looks natural and is nice and sharp when you correctly focus on an object, I did thing that it lacked a little "oomph" having a little less contrast than my control. During the day, to my eyes the image brightness between these and my controls was the same. However after sunset and in poor light, my fully multi-coated controls did seem to have a slight edge, however to me the difference was surprisingly minimal. By looking along the edges of a bright object in front of a dark background, I could also see that there was some color fringing caused by chromatic aberration which was also a little more than my controls. But to be fair, it is only really notable when you are actually looking for it and the average user would not even notice it. In regards to the view, this is one area where these performed as well as my controls as the amount of softening around the edges of the view is very minimal. 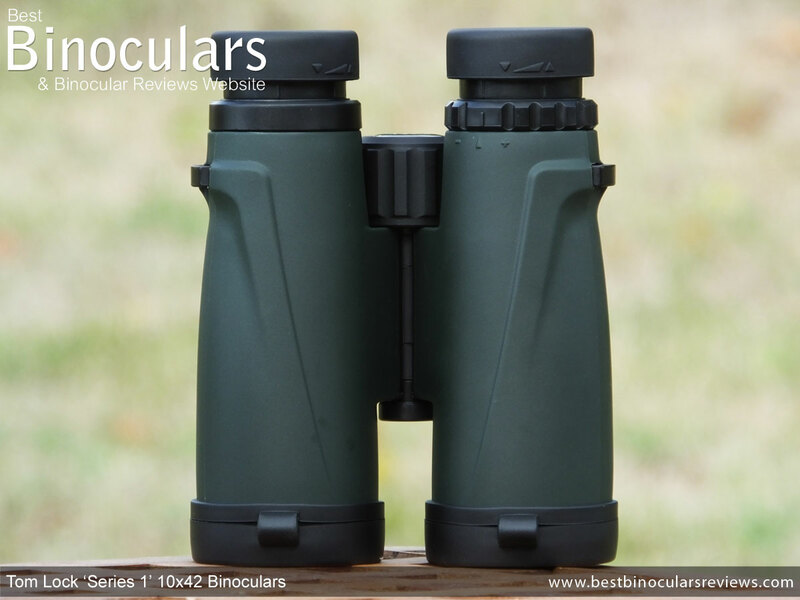 So overall, whilst the view may not match better quality binocular that cost a lot more, it is far from bad and is actually far better than what I was expecting before they arrived. 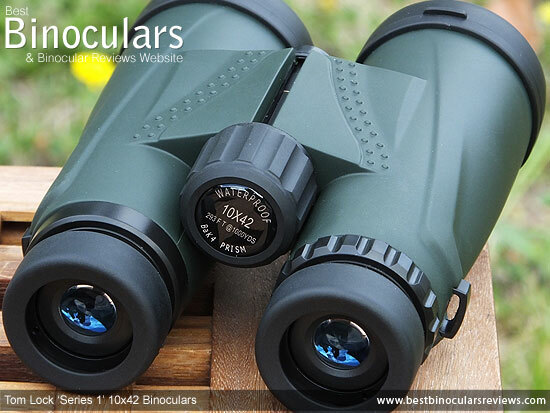 The table below compares the main stats and features of these Tom Lock binoculars with that of a number of other 10x42 binoculars that I have fully reviewed. Whilst comparing these cheap Tom Locks to those that are much more expensive may seem a little unfair, I think as long as you keep the price difference in mind, it does highlight a few interesting points. The neck strap works fine and will securely hold the bins around your neck, but otherwise is pretty basic without any padding. To be fair to Tom Lock, the strap is as good as most in this price category as this is one area where most manufacturers of cheaper optics save costs and these are no different and I would much rather see them cutting costs on the accessories than reducing the quality of the binocular and its optics. 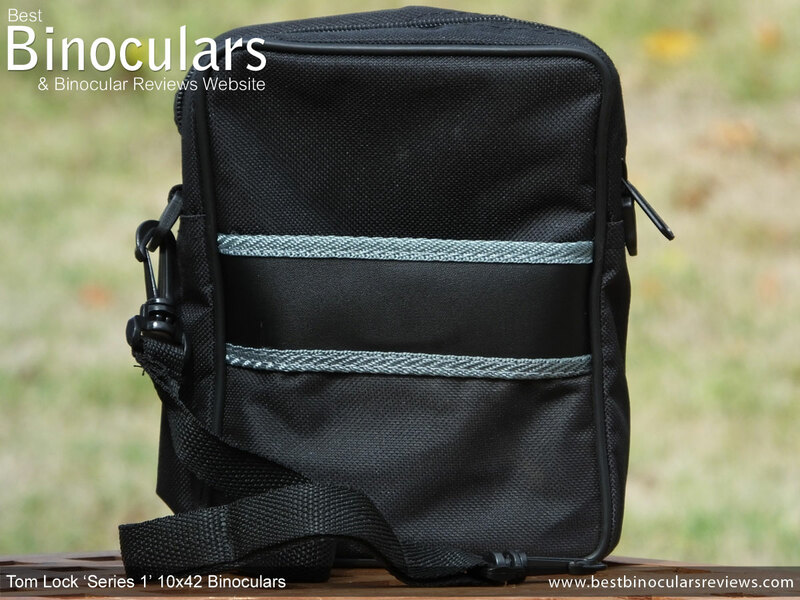 The soft carry case is definitely one of the better ones I have ever seen any cheap binocular. It is well padded and I like the fact the bins fit in snugly but still with enough room that you don't have to twist down the eyecups and fold the binoculars. In this way you can keep the binoculars stored with your desired settings making taking them in and out much less of a chore. There is an extra pocket on the front and a loop on the back that you can use to thread your belt through. The bag is zipped shut, which ensures that nothing can accidentally fall out, but the sound it opening can sometimes frighten wildlife. 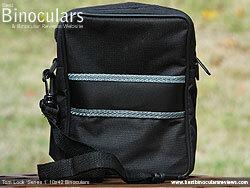 Like the main neck strap, the case strap is pretty basic and is attached to the bag with a couple of quick release clips. The rain guard or eyepiece cover is made from a semi-soft rubber, has a flexible bridge between the two cups and fits nice and securely to the eyecups on the binos. Likewise, the two objective lens caps look to be made from rubber and also fit well. They are looped and so can hang down but remain attached to the ends of each barrel when you are glassing. Also included is a reasonably good quality micro-fiber cleaning cloth, which may not sound like much, but is sometimes left out on lower cost bins to keep the cost down. The included manual is very generic and contains very basic information on how to adjust and care for the bins. 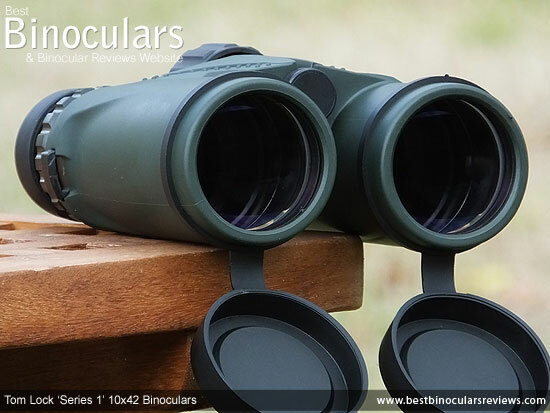 What is interesting and what I was really impressed by was that these Tom Lock 'Series 1' 10x42 binoculars was that even though these have a suggested retail price of only £49.95, they still use a few of the components, coatings and features found in much more expensive binoculars. So how are they able to pack so much in and yet still maintain such a cheap price? Well, they have cut out many of the extra costs involved with the traditional way of producing and marketing a product. This includes having them manufactured in China, taking out many of the "middle men" and reducing the amount of marketing materials. For more details check out the complete story of The 'Tom Lock' Concept. A few little things like the small plastic disc that sticks onto the end of the focusing wheel came unstuck when I first removed them from their case and whilst this was easily repaired with a little glue is a small indication that the quality control is not on a par with higher spec optics. 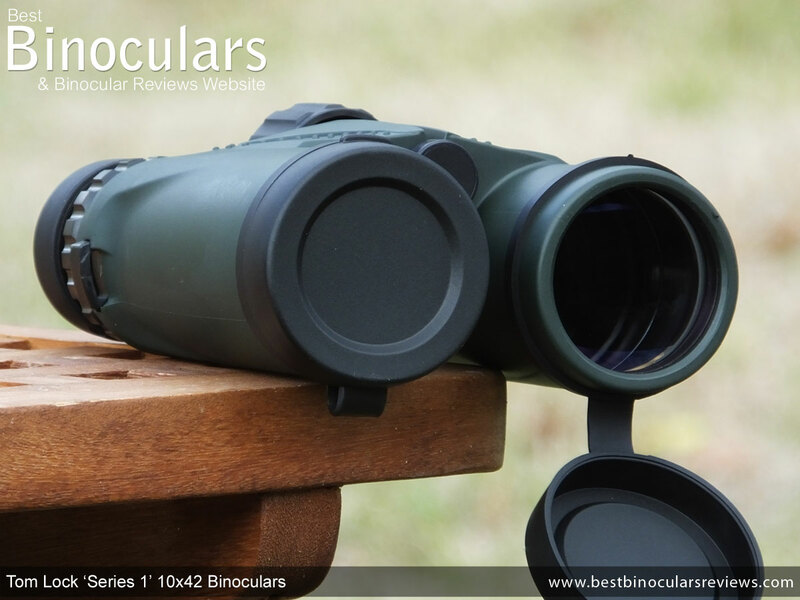 So whilst the overall quality and performance may not match that of the best binoculars, when you take into consideration their price, I would say that these make a more than decent entry level binocular that will appeal to first time buyers or those just looking for a cheap general use full-sized binocular to keep in your glove compartment, around the house or somewhere else handy at all times. Tom Lock is already in the process of developing and introducing a higher spec model, which they will be looking to take it to the Market with an SRP of around £74.95, which I really look forward to trying out.